Green cars, as we all know, are good. But if you slap a set of bronze wheels on said green car? I’ll be on board with no questions asked. What I’m trying to say is I’m extremely here for this Toyota 86 British Green Limited. It can do no wrong. still manages to grab you for a second look. On the outside, the car wears green paint, red-painted Brembo brakes and lightweight, cast aluminum wheels, coated in a handsome shade of bronze. A small, black spoiler adorns the trunk lid. Inside, a two-tone black and tan (an excellent drink choice) interior gives off an unfussy look. The shift bezel, steering bezel, register ring and center cluster door grip are painted black, while the steering wheel, shift boot and parking brake have contrast tan stitching. Also notice that the screen for the infotainment system appears to be missing. Toyota’s website quotes the green 86 as starting at about ¥3.3 million, which is about $30,000and order books are open until May 31. It doesn’t seem like this green wonder will be heading stateside, however, as it can only be found on the Japanese website. Which is a real shame! There are no greens currently available on U.S.-spec 86s. Not a loud, lime green and certainly not a beautiful British racing green such as this. 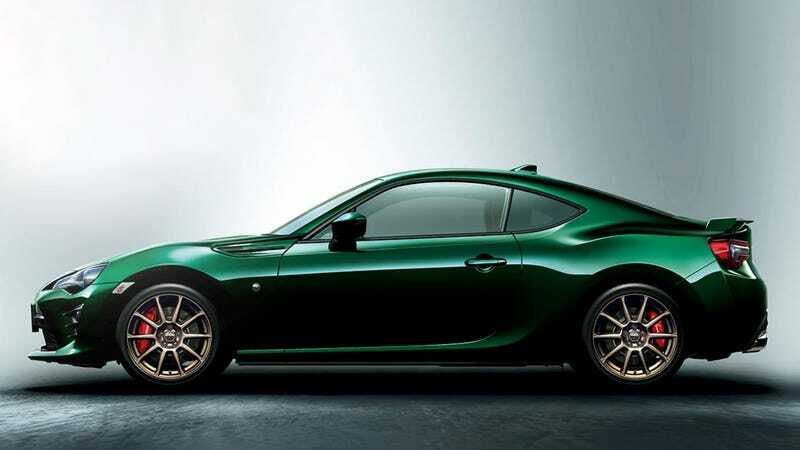 I’m fairly sure I already know the answer my question, but I’m going to ask a Toyota rep anyway to see if we’re getting the Toyota 86 British Green Limited. I’ll update if I hear back.